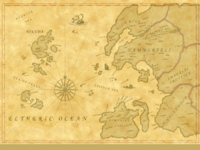 Yokuda was a continent west of Tamriel which sank into the sea during the First Era. It was the ancestral home of the Redguards, as well as a purportedly extinct Aldmeri race known as the Lefthanded Elves. It was the birthplace of several famed Redguard heroes, including Frandar Hunding and his son Divad. It was also the nation that birthed the fabled martial tradition of sword-singing. The native language of Yokuda was called Yoku, but after the Yokudan migration to Hammerfell in 1E 808, it was almost entirely replaced to help stabilize foreign trade. In addition to the mainland, Yokuda also encompassed a number of islands within its domain. These included Akos Kasaz, Bahia, Irranhu, Kanesh, Kardesh, Klithi, Samara, and Yath. It is unknown whether the landmasses south of the Sea of Pearls, such as Ravan, are or were traditionally considered part of Yokuda. The climate of Yokuda was said to be a desert, more arid than the Redguards' current province of Hammerfell, and covered with rocky, barren hills. Tremors of the earth were supposedly not uncommon in the continent's history. Arch: A great port city located in the province of Seawind. It was where the first warrior wave left Yokuda. High Desert: The province known to be the ancestral home of Frandar Hunding. Hattu Mountain: Also known as the "Father of Mountains", it was where Hunding wrote the Book of Circles. Totambu: Yokuda's capital city was situated on Akos Kasaz, the largest island in the archipelago. Other settlements on Akos Kasaz included Tagon, Taleskan, and Yul. Lumut: A settlement on Kanesh. Makan: A settlement on Yath. The origins of Yokuda is largely derived from ancient myths and legend. One creation myth suggests that Yokuda was once a part of Tamriel during the Dawn Era, but was ripped from the mainland and became a separate landmass after a destructive war among the Ehlnofey. After this destructive war, the Ehlnofey split into many different racial and aboriginal groups. The group of Ehlnofey that remained on Yokuda eventually became the Yokudans. The ruling body of the Yokudan people was known as the Na-Totambu, a council of kings who represented the various nations of Yokuda. 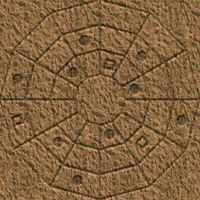 This system of government was ancient, dating back to the Merethic Era. During this time, legends speak of a thousand-year war against the Lefthanded Elves. The Na-Totambu fought to a standstill, but eventually won the war with aid from their gods Leki and Diagna. By the First Era, Yokuda had become a vast empire, and developed a tradition of being ruled by a single emperor, however this was eventually abolished in 1E 376. Although each successive emperor remained as the figurehead of the empire, his powers were very much reduced. As a result, the nation descended into three hundred years of continuous civil war between the provincial lords, warrior monks, and brigands, all fighting each other for land and power. These warlords, also known as Yokeda, built large stone castles to protect themselves and their lands. In time, towns began to grow outside these castle walls. The Yokudan people were once artisans, poets, mystics, and scholars, but the constant civil wars that plagued the nation resulted in many searching for enlightenment through the Way of the Sword. This eventually developed into a martial tradition known as sword-singing. Within a few generations, the Way of the Sword had become their life. Their poetry and artistry survived through the forging of beautiful swords woven with magic. The greatest among them became known as Ansei, or "Saints of the Sword". Ansei of the highest virtue wandered the countryside engaging in battle, righting wrongs, and seeking to end the strife. Such was the influence of the Way to Yokudan life, that everyday items would have depictions of swords or warriors assuming fighting stances. In 1E 609, Mansel Sesnit became the Elden Yokeda, or military dictator. He waged many of the battles of unification and succeeded in gaining control of almost the entire empire until he was assassinated in 1E 617. His successor, Randic Torn, took over the government and continued the work of Sesnit. Torn revived the age-old gulf between the sword singers and the commoners by introducing restrictions on the wearing of swords. "Torn's Sword-Hunt", as it was known, meant that only the singers were allowed to wear swords, which distinguished them from the rest of the population. Although Torn did much to settle the empire into its pre-strife ways, by the time of his death in 1E 737 internal disturbances still had not been completely eliminated. After his death, another vicious civil war broke out. In the chaotic aftermath, Emperor Hira rose to power and attempted to wrestle control of the empire from the people by exterminating the sword-singers. The singers were few in number but rebelled against the persecution. This conflict became known as the War of the Singers. In 1E 780, it came to a climax at the foot of Hattu Mountain, where Frandar Hunding's army of singers crushed the emperor's forces. Following the victory, Frandar and his army left Yokuda on a flotilla of ships, and began their great migration across the Eltheric Ocean to Hammerfell. This marked the first of four documented migrations of the Ra Gada or "Warrior Wave". Other accounts, possibly related to the Hiradirge, speak of "Time of Ending" when the Yokudans fell away from the teachings of their gods. They conducted forbidden rites and "fell things were summoned that should never have been called forth". In response, Satakal emerged from the sea and Yokuda was pulled down beneath the waves. Although the mainland was completely lost, several islands remained and were included on one late-Second Era map of West Tamriel. According to residents of Anvil during the late-Third Era, ships still sailed to Yokuda from Anvil, and some texts referred to the continent as if it still exists in some form. The Yokudan faith was built around the concept of Satakal consuming the world to begin another. They believed Satakal has done this many times over, a cycle which prompted the birth of spirits that could survive the transition, notably Ruptga, the first who learned how to do so. Ruptga set the stars in the sky to show lesser spirits how to do this, and these spirits ultimately became the Yokudan pantheon. Yokudan creation myth holds that they are doomed to mortality because they are very far away from the real world of Satakal, and the safe haven of the Far Shores is too far away for them to jump from the mortal world. Yokudan society was very advanced for its time, and the nation birthed great advances in architecture, astronomy, martial arts, politics, and philosophy. Their innovation in the fields of metallurgy, agriculture, leatherworking, and shipbuilding were unknown even in modern times. Their advanced agricultural experience in the arid deserts of Yokuda was of great benefit when they migrated to the lesser deserts of Hammerfell. They practiced ancient methods of metal-craft to forge their famed swords and armor. Their leather underwent a special curing process making it extremely durable, even after several centuries had passed. Much of this knowledge was recorded in steel-plated tomes, such as the Cartulary of the Tamed Dunes, that they took with them to Hammerfell. It is said that the Yokudans forgot more about steel-craft and desert survival than the Redguards ever learned. Much of the architectural style that dominates Hammerfell was directly transplanted from Yokuda. Their architecture reflected their environment, and was designed to insulate from the desert's extremes of temperature. Yokudan accent pieces, such as flying staircases or ornamental domes, were designed to crumble after an attack or an earthquake. This allowed them to be easily replaced in sections afterwards. Their constructions frequently featured descriptive tablets to aid pilgrims. Yokudan culture was noted for its use of astrology, and some Yokudans were known to use sand maps that charted the constellations to determine if the souls of the dead would make their way to the Far Shores. They associated the constellation of the Warrior and its charges with victory and success, and ancient legends speaks of travelers following the stars in the sky to reach the promised land. 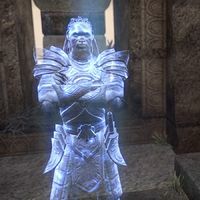 Centuries later, the famed scholar Muhay at-Turna discovered that the legend was indeed true when he discovered the ruins of Kardala in Craglorn. Memory Stones were believed to originate in Yokuda. These relics were used to record the thoughts and memories of the owner, and could be later retrieved. Many of these stones found their way into Hammerfell after the migration, but very few survived the following eras. The most notable was the memory stone of Makela Leki. Yokudan navies were superior to those found among Tamrielic kingdoms. Many Redguards, particularly the remnants of the Na-Totambu, revere and honor their Yokudan forefathers, and hold true many of their traditions and customs. When the Crowns arrived in Hammerfell, they were determined to reproduce the culture of Yokuda as nearly as possible. 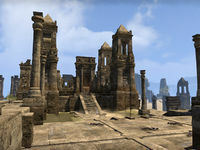 They founded a city in the Alik'r and named it Na-Totambu after their old capital. 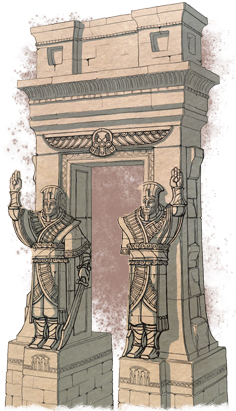 The ancient Yokudan pantheon of gods is still worshipped in parts of Hammerfell and numerous cults are dedicated to the various deities. Some Redguards believe these traditions are being forgotten as the centuries pass, and seek to return to the old ways of Yokuda. Conversely, some scholars view the Yokudans as nothing more than savage invaders who brutally suppressed the native people of Tamriel, and left nothing more than destruction in their wake. Although the Ra Gada brought over much knowledge in the form of books and scrolls, the vast majority of cultural records were lost in the cataclysm. The history and wisdom that did survive was stored in a temple known as the Seeker's Archive in Craglorn. Nonetheless, their advancements in construction and craft was admired by other Tamrielic nations, who sought to imitate and perfect it. During the mid-Second Era, countless artifact and relics of Yokudan origin could be found throughout Hammerfell. Some of the more sacred relics were kept on display in various temples. Various academic institutions, such as the Khefrem Academy of Yokudan Heritage and the Yokudan Heritage House in Hallin's Stand, were established to research the Yokudans and study translations of ancient texts. According to legend, the assassin beetles of Hammerfell were said to originate on Yokuda. Known as "Samara Scarabs", they were originally much smaller, but grew into dangerous creatures as a warning from the gods as to not abandon their worship. The Yokudan Charger breed of horse is said to be a direct descendant of the great gray war-horses Yaghoub brought in his fleet from Akos Kasaz. Ra Abah: Renowned Yokudan warrior who fought alongside Frandar Hunding in the War of the Singers against Emperor Hira. He was buried in the Valley of the Blades after his death. His teaching survived into at least the mid-Second Era. 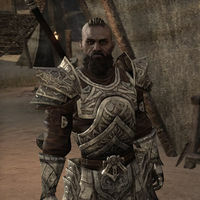 Yokeda Razul: Fought alongside Divad Hunding, leading the Ra Gada to conquer the Alik'r. When the Na-Totambu and the Yokudan nobility came sometime after, Razul made himself Yokeda to cement the power of the Ra Gada. Some remember him as the first Forebear. He was buried in Tu'whacca's Throne after his death. He was briefly raised as an undead minion of the Withered Hand in 2E 582, but was defeated and laid to rest once more. Grandee Yaghoub: The first of the Ra Gada to discover the Iliac Bay. He and his warrior-sailors landed in Hegathe and established the city of Sentinel. Emperor Tarish-Zi: Self proclaimed emperor and leader of a warrior wave known as the Anka-Ra. 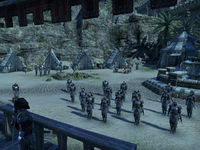 His army cut a bloody swath across Hammerfell and all the way into Craglorn in their hunger to claim a new home. Prince Hubalajad: A Na-Totambu noble who attempted to colonize Hew's Bane. Despite his best efforts, Hubalajad was foiled at every turn, and nearly all his endeavors resulted in failure. The Four: The collective name for Ansei Mamireh, Akamon, Roshadon, and Rok'dun the Flame. Said to be prominent Yokudan warriors during the early Ra Gada invasions. According to legend, their prowess with the Shehai was unmatched and they single-handedly captured Nedic fortifications, breached walls and cut down entire armies. King Xakhwan: Yokudan ruler circa 1E 853. Hailing from the island of Yath, he established colonies on the west coast of Hammerfell. He was killed by the Corelanya Clan in a conflict to drive them from Hammerfell and raised as an undead minion before being killed once more. Queen Afsar: Late in the First Era, the ruling king died with no heir and the nobles began to squabble over the throne. Afsar solidified her rule in the ancient way, by killing the opposition. Despite its bloody start, her reign was considered very peaceful. She was buried in Tu'whacca's Throne after her death. She was briefly raised as an undead minion of the Withered Hand in 2E 582, but was defeated and laid to rest once more. King Ra Boshek: A supposed "evil usurper-king" who was interned in a mausoleum in Tu'whacca's Throne. His remains were disturbed by Flaccus Terentius around 2E 578 and were removed so that they could be re-consecrated under the Rite of Re-Interment. This page was last modified on 17 January 2019, at 14:43.